Rob Zabrecky has worked throughout the United States and Japan as a magician. He is best known for performances in which he combines irreverent dark humor and mentalism. 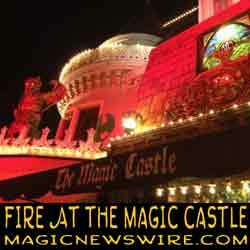 Since 2002 he has been a regular performer at the Magic Castle. In 2003 he formed the off-beat magic trio, The Unholy Three in the basement of that establishment by presenting a provocative Dada-esque combination of wizardry, mentalism and off-beat humor. In 2008, 2009, and 2010 The Academy of Magical Arts at the Magic Castle named him among the top five magicians for his performances inside the club's Parlour of Prestidigitation. Who was S.W. Erdnase? Most likely, anyone reading this knows this name as the pseudonym used by the author of "The Expert at the Card Table" which is arguably one of the most important books ever written on sleight of hand with cards. On this episode of the "Spirit of Magic" podcast, I am joined by David Ben & Julie Eng of Magicana and the publishers of Magicol. Yes, we do discuss who David, Richard Hatch and others believe to be the man behind Erdnase, but we also discuss the most recent online exhibition from Magicana, "EverythingErdnase.com" which was developed with the help of Jason England and which examines the many ways in which Erdnase has been presented in print since it first appeared in 1902. What you are about to hear was intended to be the special Halloween episode of the Magic Newswire's "Spirit of Magic" Podcast. Unfortunately, it was delayed by the fire that happened on Halloween at the Magic Castle and our interviews with those involved. In spite of this, I am still thrilled to bring you this conversation with Dan Sperry about his new two year contract at the latest attraction to appear in New York City's Times Square, "Times Scare." Thanks again to Dan for joining us and please make time to support him by attending the show when you are in NYC! On October 31, 2011 (Halloween), at approximately the time that Harry Houdini died, the magic community learned that our American clubhouse, the Magic Castle, was on fire. In this podcast, we catch up with Irene Larsen, Erika Larsen, West McDonough and Milt Larsen and are provided with an intimate an first hand look at what happened, the extent of the damage and what the future holds for the Castle. All of this on the eve of a soft re-opening of the site to members and guests. Just outside of Cincinnati, Ohio on a 250 acre horse farm, eight feet below ground in an abandoned mine shaft, there exists a legendary collection of magic props and artifacts. It is of course, Ken Klosterman's "Salon de Magie." On this episode of the Magic Newswire's Spirit of Magic podcast, we talk with Ken about his love of magic, how he bagan collecting and why he has decided to part with some of his treasures in an upcoming auction. He also shares a few antic-dotes about magicians visiting the Salon such as Teller and David Copperfield. I feel certain that anyone that is a regular listener of the Magic Newswire's "Spirit of Magic" podcast will assume that I have a "To Do" or Bucket List of interviews that are of the highest priority to me. If you understand that, then you'll certainly understand why the guest on this podcast is near the top of that list. John Gaughan is one of the most highly respected illusion designers, creators and builders today. He's also a remarkable historian and collector. If you aren't familiar with John, then please climb out from under your rock and join me for an outstanding interview! Morgan Strebler joined me on the Magic Newswire just over a year ago to promote the upcoming opening of his new show at the Pat Boone Theater in Myrtle Beach where he was signed to a five year contract. More recently, there have been reports in the press on the delays surrounding the opening of the venue and Morgan's departure from the project with many reasons given, including possible issues with his health. Morgan joins me for an exclusive chat to clear the air and to let people know what is really happening with him and what is in store for the future. A recap of EMC 2011 by three of the presenters, David Kaye, Jonathan Bayme & Rudy Coby, and two attendees, myself and Chris Martin. In 2008, Neil Patrick Harris & Guy Hollingworth began a colaboration. Following a sold out run at the Edinburgh Festival and a series of international shows culminating in a sell-out success at the infamous Magic Castle in LA and an amazingly well received presentation at Stan Allen's "Magic LIVE," Guy Hollingworth begins a new presentation of his acclaimed one man show, The Expert at the Card Table " in Los Angeles today. In his one man show, Guy presents amazing exhibitions of card chicanerywhile telling a fascinating tale of trickery, deceit and death. Based on the book of the same name, The Expert at the Card Table tells the story of two boys whose innocent love of card tricks develops in adulthood into a dangerous game of hustles, street cons and murder. Published anonymously in Chicago in 1902, the book describes in great detail, original and brilliant methods for conjuring effects, whilst at the same time revealing the author's true intent, a full exposé of the underground techniques used by hustlers, card cheats and con artists. This performance begins today, July 13th at the Edye at the Broad Stage and runs through August 7th. Buy your tickets NOW! In this episode of the Magic Newswire's "Spirit of Magic" podcast, my guest is best selling author and psychologist Ruchard Wiseman. My friend Brian Brushwood joined us to cohost. Richard's most recent book release "In his latest book, Paranormality," Richard discusses how a disbelief into paranormal concepts like elepathy, fortune-telling and out-of-body experiences can produce insights into our brains, human behavior and belief systems. Last year, Luis de Matos and Marco Tempest introduced a revolutionary new concept, and online magic convention with a world renowned line-up of presenters. In addition to being able to watch live as the event unfolded online, everyone that was a member of EMC received a complete DVD boxed set of all of the presentations and several bonus segments. This year, they are doing it again with EMC 2011! Find out how to win a free pass and why you'd want to register when you hear what Marco & Luis have to say about the second installment of this amazing online gathering! On this special edition of the Magic Newswire's "Magic Newscast," I am joined by Brian Danie of Creative Magic (CreativeMagic.net). What I love about Brian and his story is the fact that he thought outside the box, both literaly and figuratively, as a designer, manufacturer and builder known for light weight props. 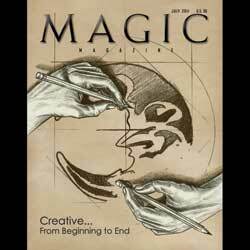 Yesterday, Brian announced that he will cease manufacturing of all Creative Magic products. On this episode of the podcast, Brian shares exclusive details on how he plans to wrap the company, a story that brings him to the cover of the latest issue of Magic Magazine. Thanks to the hard work of Cameron Ramsey, we put together the first ever Magic Newswire fan meet-up at the first ever "International Magic Experience" in Las Vegas. Scott Wells and David Kaye grabbed the reins to give us all a taste of what we missed and hosted the meet-up to give away the prizes so generously donated by friends of the show. In this episode, Scott & David are joined by Rudy Coby, Banachek, Brian Brushwood, Danny Garcia, Bizzaro, CJ Johnson, Tim Ellis, Mathew Unwin, Craig Mitchell and many others. If you missed it live, have a taste of IMX! Join us for the first ever Magic Newswire Meet-up on May 23rd at IMX 2011! Rudy Coby, Brian Brushwood, Banachek, Danny Garcia, Michael Ammar, CJ Johnson, Tim Ellis, Craig Mitchell, David Kaye, Cameron Ramsay, Scott Wells, Michael Ammar and more will meet you there! You can win any number of prizes including an Anything s Possible bottle from Jamie D Grant, yet to be released Erdnase cards from Conjuring Arts, copies of Jay Sankey's "Bending the Real", The new Tarbel Course from Trickshop Magic, Rudy Coby's complete Magic Experience, a free pass to the upcoming Essential Magic Conference and so much more! Even if you don't attend you can win! Scott Wells brings Magic Newswire listeners to the 41st edition of Fechter's Finger Flicking Frolic with daily interviews and reporting from the original closeup conference. In this episode he talks with people like Allen, Pinner, Wild, Saterial, Joshua Jay, Andi Gladwin, Yumi, Obie O'Brien, Stone, Beam, Shawn, McDonald, Bargetze and more. 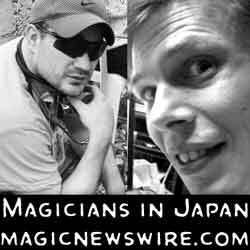 Brothers Dan & Dave Buck launced an all new magic conference in 2010 and called it Magic-Con. Their vision was to launch an interactive conference for those serious about the art of magic, where you can share ideas, insight, and a common experience while working together towards the advancement of an artform. The goal of the annual Magic-Con is to provide a platform for magic’s smartest thinkers, greatest visionaries, and top performers and to introduce an intellectual mentality behind the art, science and technology of magic. The Magic Newswire was very fortunate to have two roving reporters on site to being us a taste of the experience. Thanks to Alejandro Portela, aka "The Cuso" and Doug McKenzie for helping with this episode of the podcast! On this episode of the Spirit of Magic podcast I am thrilled to have as my guest one of the most creative minds in magic, Jay Sankey. Among many other topics, we discuss the impending release of his latest project "Bending the Real." Jay originated the 'bending movement' in the fall of 2009 and because of his unique performance style, this has become Jay's most anticipated project ever! 'Bending the Real' is an inspired collection of 'low sleight' deceptions, each designed to mess with human minds from a different sensory or rational angle. We step out of the box a bit with this special episode of the Magic Newswire podcast. Gary Vaynerchuck has been featured in The Wall Street Journal, GQ, and Time, appeared on Late Night with Conan O'Brien and Ellen. Vaynerchuk has been described as "the first wine guru of the YouTube era", "the wine world's new superstar",and by Rob Newsom, a Washington State wine maker, "outside of Robert Parker, probably the most influential wine critic in the United States".In the July 2009 Decanter publication of "The Power List" ranking of the wine industry's individuals of influence, Vaynerchuk placed at number 40, citing that he "represents the power of blogging". Now he joins us on the Magic Newswire to discuss the power of social media in building individual brand identity and his new New York Times Bestselling book "The Thank You Economy." Gary says, "I feel that we're living through the biggest culture shift of our time. The internet, itself, is 17-years-old. It's just hitting the social part of its life. It's just like growing up. As you get to 13, 14 and 15, you want to go out and go to parties. That's what's happening right now! The internet is growing up." Find out why this should matter to you as a magician! On June 28th, the International Brotherhood of Magicians will gather together for their 83rd annual convention in Dallas, Texas. Chase Goforth, Scott Wells, David Sandy, Lance Rich, Roger Miller and I get together to talk about why you should care. Are big conventions relevent? If so, why? If you have to choose one convention to attend this year, why would it be this one? Remember that it you regsiter for this year's IBM before April 1st, you'll get a $50 discount on the total price of registration! Criag Mitchell, Banachek, Wayne Houchin, Cameron Ramsay and I get together to talk abou the first ever "International Magic Experience." With over 20+ of magic’s finest stars descending on Las Vegas from the 23rd – 25 May – IMX 2011 is one event that you cannot afford to miss! In addition, Magic Newswire fans will have a chance to get together where we'll they can hang out with some of the biggest names in magic and win prizes like the complete Banachek DVD PSI series, 10 DVDs from Danny Garcia, Michael Ammar's "Magical Arts Journal," the complete Tarbell Course from TrickshopMagic.com, a year's subscription from MagicMagazine.com, Wayne Houchin's "Sinful" and "Thread through Eye," and much much more! In addition, if you head over to the IMX Facebook page and comment today, you might just win an all expense paid trip to IMS 2011 in Las Vegas! Jason England is one of magic's leading experts on all things Erdnase. Recognized as an authority on casino gambling, specifically, cheating with cards. He has some of magic's most dangerous hands. Influenced by Steve Forte, Richard Turner, Dai Vernon, and Darwin Ortiz, Jason is an amazing resource. This interview was recorded just over eighteen months ago, I had thought that this interview had been lost in a hard drive crash. I'm thrulled to have been able to breathe new life into it and share it with you today. On this episode of This Week in Magic, Cameron Ramsay, Scott Wells and I get together with Dan Sperry and Jeff McBride to talk about the upcoming World Magic Seminar. What began as the Desert Close-Up Magic Seminar featuring the great Tony Slydini, with less than 100 attendees in 1978, has now become the premier annual magic event, the World Magic Seminar, with over 1000 attendees, and Las Vegas has become the “Magic Capitol of the World”! The memories made in the past give the Seminar its reputation, but it’s the memories to come that make it exciting. Jim Steinmeyer joins us again to tell the story of the man that he calls "The Last Greatest Magician in the World," Howard Thurston. Jim's new book explores how Thurston went from a homeless hobo with a checkered past to one of the most successful performers of his age. While Houdini's daring stunts were legendary, Steinmeyer says Thurston was the public's favorite, captivating audiences with his self-assured grandeur. There is no greater expert on the history of magic and few stories as interesting as that of Thurston as portrayed in Jim's latest book. 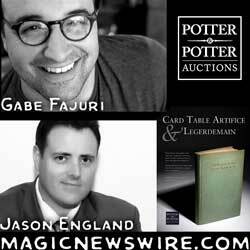 On this special Magic Newscast we get a preview of the upcoming Gambling Memorabilia Auction with Gabe Fajuri from Potter & Potter Auctions. 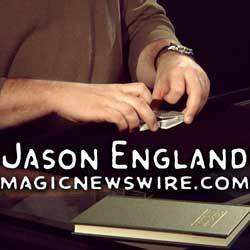 In order to help we two magician put things in the proper light, I am also joined by gambling expert Jason England. Mr. England has written, consulted on, or edited over a dozen of the best-selling gambling and/or sleight-of-hand books published in the last decade and has acted as the gambling consultant and performer in numerous television and movie projects. In case you haven't seen it already, you can have a peek at the PDF version of the catalog for the January 29th Auction HERE. The UK television audience recently got to know magician John Archer when he became the first performer to win on the show "Penn & Teller Fool Us." John is a comedian, magician, actor, singer, musician, writer, member of 'The Inner Magic Circle with Gold Star' and is the current ‘Magic Circle Stage Magician of the Year.’ John joins me on the Spirit of Magic podcast and talks about his evolution from policeman to magician, how he fooled Penn & Teller and much more! Previous Magic Newswire guest R. Paul Wilson rejoins us to talk about his role as consulting producer for the BBC1 show "The Magicians." Paul and I talk about the success of the show, the impact that this show will have on future magic broadcasts and the response of the magic community. On this episode of the Spirit of Magic podcast, I am joined by previous guests Todd Robbins and Johnny Thompson. We are also joined by first time guest Teller! We obviously have gathered to discuss their new Off Broadway show "Play Dead" which was written and directed by Teller, performed by Todd Robbins and in which the Great Tomsoni consulted. Magic and mystery are combined to bring joy to the audience by scaring them to death and we talk about how that is possible! On this episode of the Magic Newswire's Magic Newscast we have a chat with Stan Allen on the day that the new Magic Magazine App appears on iTunes. Now you have three choices. You can subscribe and have the magazine mailed to you, you can buy the dead tree edition of Magic at your local magic shop, or you can buy them online in a digital format designed for the iPad. What about digital subsciptions you ask? Well, Stan discusses that and much more as he makes his wat to California for a reunion of the Long Beach Mystics.